A top notch cable system allows you to work your chest and shoulders through various crossover workouts. Bottom Pulley. Conveniently placed safety catches allow for a safe and efficient strength training workout. 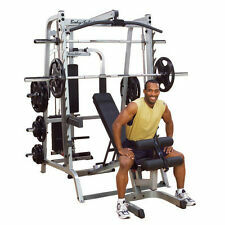 Eliminate the need for a spotter and safely lift with this Smith Machine from Titan Fitness™. Great for full body workouts, this smith machine is the perfect addition when keeping safety in mind for benching, military press, squats, calf raises, and much more! The bar is counter-balanced for a starting weight under 15 lbs. This is an ideal way for users of all strength levels to perform a wide range of upper and lower-body exercises. Excellent Condition. Adjustable Start Position. The Fitking Smith Machine combines the best features of a free-weight gym with a built-in premium Smith machine. The new FITKING Smith is one of the safest self-spotting gyms available. The new FITKING Smith features dual bar holders and safety rail spotter arms. 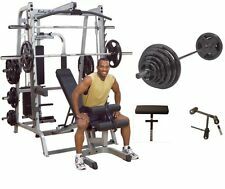 Body Solid Series 7 Smith Machine Package - GS348QP4 - Make and offer! - NEW! Eight-position back and seat pads adjust from decline to a 90 shoulder press position. This is not just another smith machine. Now, with the Body-Solid Series 7 Smith Gym System, you can trust that you're getting the best system available. 5 out of 5 stars - Body Solid Series 7 Smith Machine Package - GS348QP4 - Make and offer! - NEW! 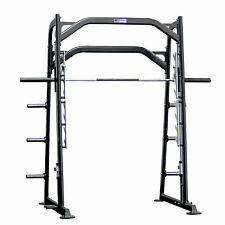 1 product rating1 product ratings - Body Solid Series 7 Smith Machine Package - GS348QP4 - Make and offer! - NEW! Fitness Reality. Real People. Real Results! Each pair of bars can handle a weight capacity of 800 lbs and are adjustable to 19 height levels to give you a total range of work out positions. The Fitness Reality 810XLT Power Cage can be combined with the Fitness Reality 1000 Super Max Weight Bench to extend your training routines to over 20 exercise workouts. Key Features ManufacturerBody Solid. This item can not be used on its own. Add on your own weight plates for extra. That is how you get real results. And there's only one thing you really want from your gym system. This is not just another smith machine. Now, with the Fitking Smith Gym System, you can trust that you're getting the best system available. Precor Icarian Smith Machine. For Sale is a Precor Icarian Smith Machine. Can be painted any custom color. Remanufactured - 6 Months Parts & Labor Warranty. Our machines are thoroughly tested and professionally remanufactured to a "like-new" condition. The trustworthy design lets you exercise virtually every major muscle group in your body. The professional carriage system utilizes patented nylon bushing technology and eight sealed ball bearing, high resin pulleys. A multi-tiered squat rack will provide ample security when lifting. An adjustable bench can be placed in incline & decline positions to perform more customized lifts. 6 leg developers let you work each muscle in your lower body. Uses four 2"x2" 12gauge steel pillars to support and guide the patented Super-Glide carriage during your most vigorous sets. 14 lockout positions and adjustable safeties assure the lifter ultimate safety while striving for greater muscle gains. Yukon's new Caribou III gym combines the best features of a free-weight gym with a built-in premium Smith machine. The gym enables you to experience the feel of free weights with the safety of a Smith machine. Each pair of bars can handle a weight capacity of 800 lbs and are adjustable to 19 height levels to give you a total range of work out positions. At the back of the Power cage, two rear stability bars are added to provide solid state performance while performing strength training exercises. Body Solid Series 7 Smith Machine - GS348Q - Make an offer! - NEW! 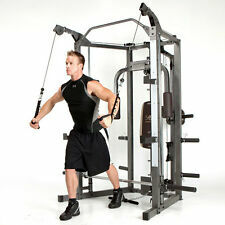 Body-Solid Series 7 Smith Machine (GS348Q). The Series 7 Smith Machine. The Series 7 works great with any bench for intense chest and shoulder routines. The truck driver will bring the truck curbside or to the end of the driveway. (Cybex counter balanced smith machine with linear bearings. This model is very popular due to it's shorter height. 1) zip code. 3) Is a lift-gate required. 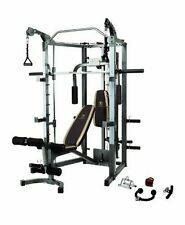 Body-Solid GS348QP4 Series 7 Smith Machine Gym Set. That is how you get real results. And there's only one thing you want from your gym system. This is not just another smith machine. Now, with the Body-Solid Series 7 Smith Gym System, you can trust that you're getting the best system available. All service must be provided by a technician authorized by us. Any service provided by anyone other than an authorized technician will result in the warranty being null and void. If item is believed to be faulty, we will schedule a technician to diagnose and repair machine. PFID130X Powerline Flat/ Incline/ Decline Bench. ManufacturerBody Solid. Product TypeSmith Machines. SP150 150Lb. Weight Stack. Heavy Duty Adjustable Safeties. Product Details. 1 Year Parts. Our new Caribou III gym combines the best features of a free-weight gym with a built-in premium Smith machine. The gym enables you to experience the feel of free weights with the safety of a Smith machine. The Body-Solid ProClubLine SCB1000 Smith Machine is the ideal partner for a total body workout in any space-challenged facility. Oval 11-gauge steel gives the SCB1000 a modern look and fantastic stability. Oval 11-gauge steel gives the SCB1000 a modern look and fantastic stability. Case hardened rods and club-quality bearings ensure smooth performance at any weight. Add it all up and you've got the perfect smith machine for any facility. Weight bar is counterbalanced to just 13 lbs. ManufacturerInflight Fitness. Six weight horns standard. It provides a space efficient way to do a variety of exercises. You can work both your upper body and lower body muscles with this great piece. 127cm x 198.62cm x 213cm. 50"(W) x 78.2"(L) x 84"(H). The weight bar is counterbalanced to just 13 lbs. Each pair of bars can handle a weight capacity of 800 lbs and are adjustable to 19 height levels to give you a total range of work out positions. 800 lbs weight capacity for both cage and bench. 19 adjustable height levels for the safety bars. 5 lb black cast steel weight stacks 15 plates total. Weight stack system- 80 lb cast steel. Top plate, 15 hole selector rod, pin, and number stickers. Counter Balanced Olympic Bar starting weight 5 lbs. THIS WILL REQUIRE 1 OR 2 STRONG PEOPLE ON SITE. Case hardened steel guide rods. Labor / Electronics – 1 Year. Angle of Smith Machines enables user to have proper squat form. WEIGHT 368 lbs. Patented 3-D barbell motion provides for an almost unlimited array of exercises. The horizontal motion can also be locked for conventional "Smith Machine" type exercises. Hooks and safety spotters travel with you. Safe guided motion to keep you from losing your balance and eliminate the need for a spotter. Ergonomically designed oval, 11-gauge steel that gives the SCB1000 a modern look and superior stability. Key Features. Designed using state-of-the art technology, Body-Solid Rubber Grip Olympic Plates surpasses all others in quality, accuracy, reliability and price. Impact-resistant, these Olympic Plates will not split, crack or peel. The Series 7 Smith Machine. The Series 7 works great with any bench for intense chest and shoulder routines. Accurate within 2 percent or better of stated weight, Body-Solid Steel Grip Olympic plates are cast from the highest quality gray iron, creating an exceptionally strong and durable product. The Body-Solid Series 7 Smith Machine w/ 400 lb. Rubber Grip Olympic Weight Set. Body-Solid Series 7 Smith Machine w/ 400 lb. Rubber Grip Olympic Weight Set. Selectorized Weight Stack. Body-Solid Series 7 Smith Machine. The Body-Solid Series 7 GS348Q Smith Machine can get you where you want to be Bigger, Faster and stronger. This Body-Solid Series 7 GS348Q Smith Machine will help you achieve a rapid path to good health, physical fitness and the body you really want. (1) BodyCraft Jones Club Machine with Jones Active Balance Bar. BodyCraft Jones Club Machine - The Safest Barbell Ever Made! Patented 3-D barbell motion provides for an almost unlimited array of exercises. Designed using state-of-the art technology, Body-Solid Rubber Grip Olympic Weight Plates surpasses all others in quality, accuracy, reliability and price. Impact-resistant, these Olympic Plates will not split, crack or peel. ManufacturerYork Barbell. Weight bar angled at 5 degrees. Linear bearings on 1 1/2", case hardened shafts ensure smooth operation. Multi-functionality ensures lifting variety. Product TypeSmith Machines. Adjustable red safety catches ensure proper execution of all exercises. Rotating Olympic handle insures easy release and reset of bar with each set. Counterbalanced Olympic bar with 15 lb (7 kg) take off weight for all user levels. 1 x FID Bench. That is how you get real results. And there's only one thing you want from your gym system. Designed using state-of-the art technology, Body-Solid Rubber (urethane) Grip Olympic Plates surpasses all others in quality, accuracy, reliability and price.